This article is about the 1996 film. For the Destiny's Child song, see Get on the Bus (song). 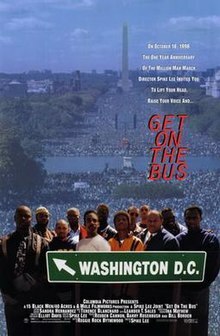 Get on the Bus is a 1996 drama film about a group of African-American men who are taking a cross-country bus trip in order to participate in the Million Man March. The film was directed by Spike Lee and premiered on the one-year anniversary of the march. For Spike Lee, this was the first time that he did not act in one of his own films. Fifteen disparate African American men board a bus in Los Angeles bound for Washington, D.C., where they plan on attending the Million Man March. Other than their race, destination, and gender, the men have nothing in common: George is the trip organizer; Xavier is an aspiring filmmaker hoping to make a documentary of the March; Flip is the vain but charismatic and openly homophobic and sexist actor; Kyle and Randall are a homosexual couple; Gary, a biracial police officer; Jamal is a former gang banger turned devout Muslim who has evaded prosecution for the murders he committed; Evan Jr., is a petty criminal who has been permitted to break probation to attend the march on the condition that he remain handcuffed to his father, Evan Sr.
As the bus travels across country, Xavier conducts interviews with the various attendees, allowing them to express their views on race, religion, and politics. The interviews often provoke outbursts from other men on the bus, invariably leading to many political confrontations. Jeremiah, the eldest member of the group, is an 80-year-old former alcoholic who lost his job and family, has found new meaning in life and is energized by the Million Man March, and embraces his African heritage; his philosophies on the black experience and stories of precolonial Africa serve to unite the men and ease tensions and the infighting among them. En route the bus breaks down and the men are forced to board another bus, driven by an ethnically Jewish white man named Rick. A couple of the passengers harass Rick as a white man, and Rick ultimately refuses to drive any further, citing the group's prejudice and his opposition to antisemitic remarks made by the leader of the march, Louis Farrakhan. George, himself a bus driver, accuses Rick of cultural racism, but begrudgingly agrees to cover for Rick who leaves. George takes over driving for the remainder of the trip, with help from Evan Sr.
As the bus passes through the American south, the men are greeted hospitably by several white southerners at various restaurants and rest stops. At one stop, the men pick up Wendell, a wealthy African American Lexus salesman who sees attending the march as a way to make business connections. After Wendell, a self-proclaimed conservative Republican makes disparaging remarks about who he sees as lazy and stupid African Americans—while getting some agreement from Kyle, ultimately is too insulting and just wants to make money off the march, and the rest of the men forcibly toss him out of the bus. In Knoxville, Tennessee, the bus is pulled over by a pair of racist state troopers, who accuse the men of using the bus to smuggle drugs. The bus and its passengers are checked by a drug-sniffing police dog, turning up no evidence of drugs; the troopers then condescendingly allow the bus to resume its journey. As the bus nears Washington, Jeremiah passes out and is rushed to a hospital. The doctors there discover that Jeremiah is suffering from advanced coronary artery disease, which made the stress of the trip potentially deadly for him. Evan Sr. and Jr., Gary, Jamal, and Xavier opt to stay with Jeremiah at the hospital and watch the march on television while the rest of the men leave in the bus to attend. Shortly after they leave, Jeremiah dies. The rest of the group returns to the hospital, saying that, to stay true to the spirit of the March, they chose not to attend the march but to return and be with Jeremiah. As the bus prepares to return to Los Angeles, the men find a prayer that Jeremiah wrote with the intention of praying it when the bus arrived at Washington, D.C. The men drive to the Lincoln Memorial, where George leads the men in Jeremiah's prayer, and the film ends with Evan Jr. and Senior's handcuffs left at the Lincoln memorial. George (Charles S. Dutton) – the bus driver and trip organizer. Jeremiah aka "Pop" (Ossie Davis) – a downsized senior citizen who is an expert on African-American history. Evan & Evan Jr. aka "Smooth" (Thomas Jefferson Byrd and De'Aundre Bonds) – an estranged father and son who are court ordered to be shackled together for 72 hours after Junior's arrest for petty theft. Kyle & Randall (Isaiah Washington and Harry Lennix) – a gay couple in the midst of breaking up. Flip (Andre Braugher) – a narcissistic actor. Gary (Roger Guenveur Smith) – a police officer who is half black and half white. Xavier aka "X" (Hill Harper) – a UCLA Film School student who is making a documentary. Jamal (Gabriel Casseus) – a former gangster turned Muslim seeking redemption. Jay (Bernie Mac) – a bubble gum company owner. Mike (Steve White) – a conspiracy theorist who thinks the march is a plot to gather one million black men in one place for mass extermination. Craig (Albert Hall) – the original bus driver who is dealing with his teenage daughter's pregnancy. Jadi McCurdy as Ja-Dee, a young man with dreadlocks. Hosea Brown III as Doc. Brown, a real-life M.D. who served as the set doctor during filming. Guy Margo as Khalid, a member of the Nation of Islam. The soundtrack to the film, Get on the Bus: Music from and Inspired by the Motion Picture, which was available on 40 Acres and a Mule Musicworks and Interscope Records, only had one charting single, which had a music video with clips from the film: "New World Order" by Curtis Mayfield. Michael Jackson recorded the song "On the Line" specifically for this movie. It can be heard during the opening credits. Although it wasn't included in the soundtrack, it was released on the Limited Edition Minimax CD included in the Deluxe Collector Box Set of Michael Jackson's Ghosts in 1997, with a longer version released on the 2004 box set The Ultimate Collection. The film received generally positive reviews. On Rotten Tomatoes the film scored an 87% rating, based on reviews from 42 critics. Critic Roger Ebert gave the film a perfect four star rating, stating "What makes Get on the Bus extraordinary is the truth and feeling that go into its episodes". Todd McCarthy at Variety praised the film calling it "A vital regeneration of a filmmaker's talent as well as a bracing and often very funny dramatization of urgent sociopolitical themes" and he called the film "Spike Lee's most satisfying work since Do the Right Thing." The film was entered into the 47th Berlin International Film Festival where it won an Honourable Mention. ^ a b JUDY BRENNAN (October 16, 1996). "The 'Bus' Stopped Here". Los Angeles Times. ^ a b "Get on the Bus Genre". Rotten Tomatoes. Fandango Media. Retrieved November 18, 2018. ^ JANET MASLIN (October 16, 1996). "An Anniversary Tribute To the Million Man March". The New York Times. ^ Roger Ebert (October 18, 1996). "Get on the Bus". Chicago Sun-Times. ^ "Berlinale: 1997 Prize Winners". berlinale.de. Retrieved 2012-01-08.